When I have a few extra minutes I can give you a more detailed analysis of your pitching delivery. The one movement that stands out to me is you pitching arm elbow. Your elbow is in what I would call a half of inverted w at landing. You take your elbow back and lift up with the elbow. See pic below. 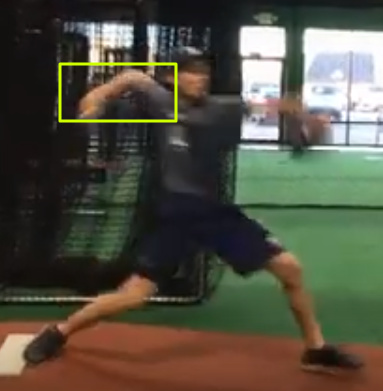 Here is what I know about a high elbow and the Inverted W. - There is plenty of debate on whether or not the Inverted W is problematic or not. What I do know is that the Inverted W can but not always cause a timing problem. The pitching arm doesn’t get into the correct position when the shoulders start turning which is often when the front foot plants. The problem is the timing associated with that move, not the move itself. The good news is that the Inverted W has never been proven to cause arm injuries. There are many pitchers that pitch with a high elbow. The question is, have you ever had stress on the elbow and or shoulder? How is your command? If you have had any issues with these 2 questions, the high elbow may be the cause. I have never had any elbow or shoulder pain except for a couple days after a full game. It is not a sharp pain and have always figured it to be standard muscle soreness. As for my command I have not had any issues with command. I usually stay around 65% for strikes for a complete game. Thank you for the input and look forward to hearing a complete eval of my delivery. I am sitting comfortably at 84-85 mph and top fastball of 87-88. Hey Devin, your mechanics are pretty solid. However, there are a few movements that I teach differently that will help you sit better into your delivery. First, I teach my pitchers to use their entire back foot flat on the ground. They learn how to use ground force to start their momentum down the mound. They treat the bottom of their drive foot as though they have an upside down pyramid on the bottom of their cleat dug into the ground. 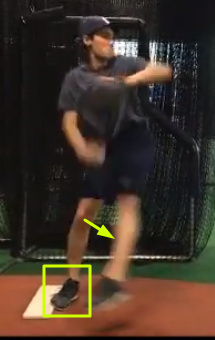 Pitchers that use part of the pitching rubber by placing either part of their foot or in some cases all of the foot on top of the pitching rubber increase the likelihood of early rotation by driving their knee down instead of having their knee over their ankle, leading with the hip, and they become quadriceps dominant. 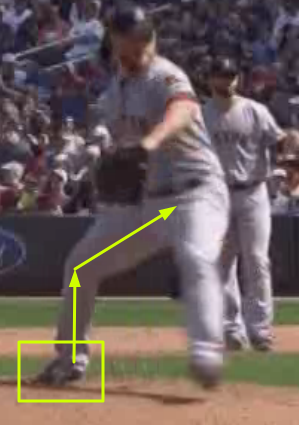 A lot of pitchers do not use their back leg correctly therefore they can not sit into their delivery. What you see is exactly what I have been told to work on. I have been told that if I engage my lower half that i could add up to 5 miles. This advice came from a D1 pitching coach.